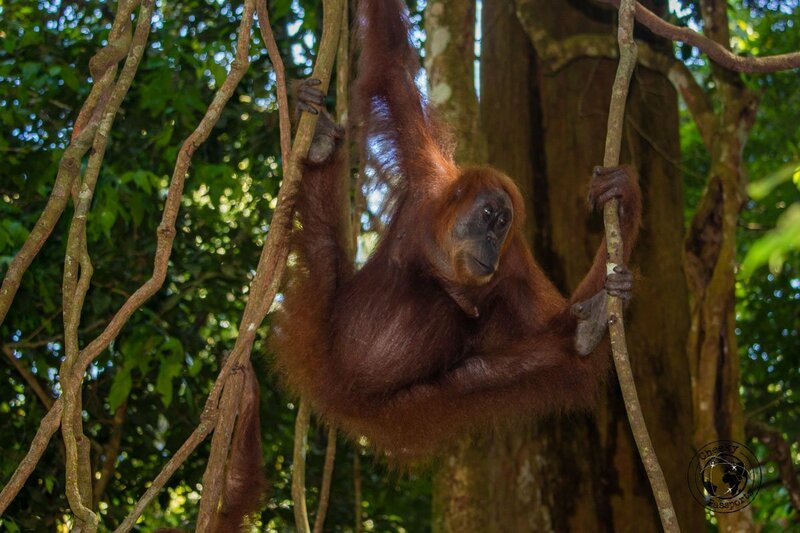 We were initially confused about planning out a trip to Indonesia, a country which is home to 17,000 plus islands, but one thing which we were sure of was that we wanted to go on a Bukit Lawang trekking experience to spot the orangutans in Sumatra! There are only two places in the world where you can spot orangutans in the wild, and they happen to be very close to each other. One of these is the Indonesian island of Sumatra. The orangutans in Sumatra can be spotted in the Gunung Leuser National Park within its dense jungles and forests. The other is the island Borneo which is actually shared between Indonesia, Malaysia and Brunei. Orangutans can be spotted in the Indonesian and Malaysian parts of the island. Since we had always planned to start our travels in Sumatra, Indonesia’s westernmost large island, a Bukit Lawang trekking experience to observe the orangutans, seemed to make logistical sense. Book your Bus, Rail or Ferry tickets in Sumatra online with Easybook or 12Go Asia. 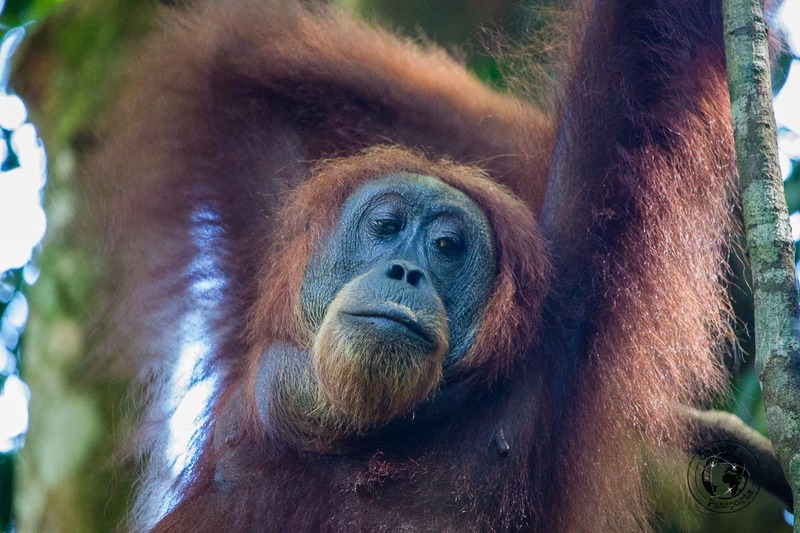 Interesting to note that the word orangutan is derived from the word ‘orang’ meaning person (in Indonesian and Malay) and ‘hutan’ meaning forest, so the word literally translates in “person of the forest”. 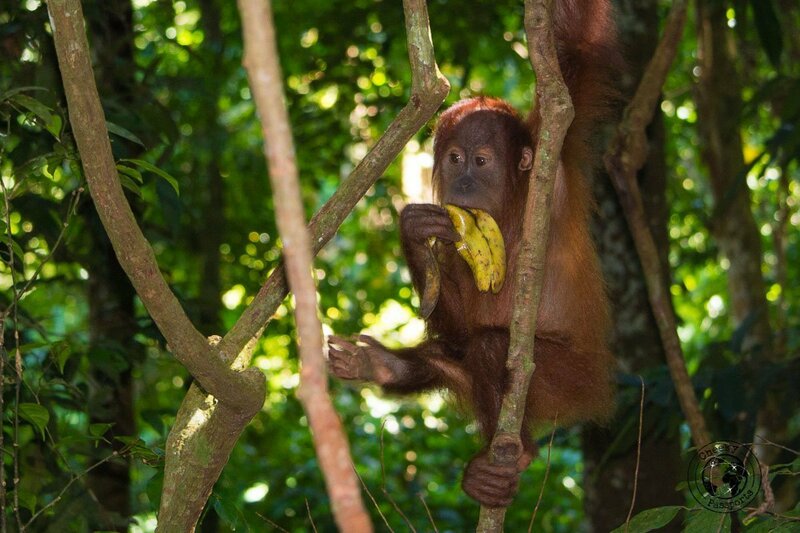 It is quite easy to book a package tour for Bukit Lawang trekking to spot the orangutans in Sumatra. Various agencies in Sumatra offer all-inclusive multi-day packages including transport, accommodation and a Bukit Lawang jungle trek. Because we are budget conscious, and we don’t mind traveling independently, we wanted to avoid any form of all-inclusive package tours. 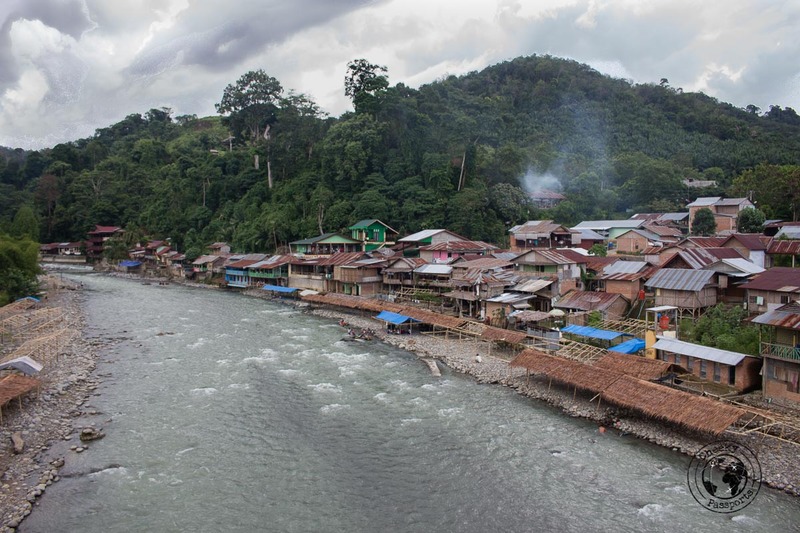 Read on as we describe our top tips and recommendations for getting to Bukit Lawang and organising a jungle trek there. Sumatra is the sixth largest island in the world and traveling independently between its different regions is no mean feat. Our gateway to Sumatra was Medan, one of the largest cities in the region to which we flew from Singapore. Medan is a totally nondescript travel destination, but its proximity to Gunung Leuser National Park, where we wanted organise our Bukit Lawang trekking experience, made it a fantastic starting point. Check the flights to Medan on Kiwi or Nusatrip. A public minibus runs from Medan to Bukit Lawang early in the morning and usually costs around 25,000 IDR (Indonesian Rupiah) (€1.50). 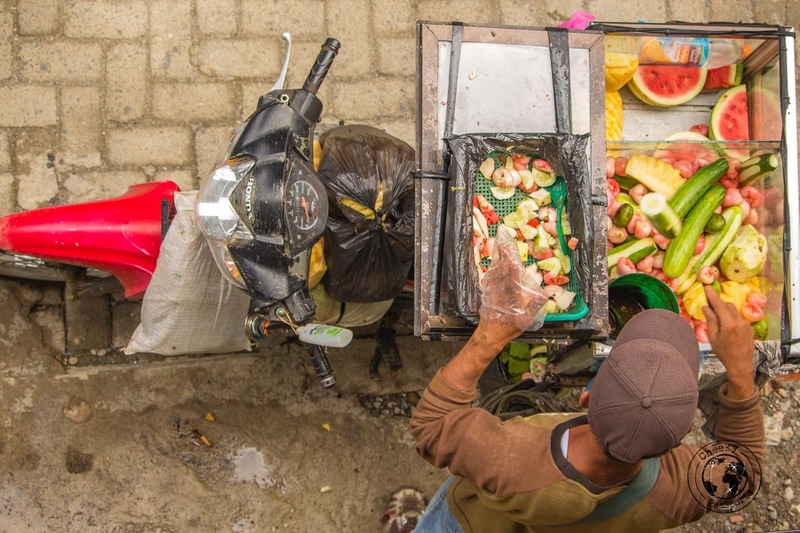 The route is well-known for touts and scammers wanting to rip off and overcharge tourists. You are advised to pay the driver only when you reach the final destination despite the possibility of being bullied into doing otherwise. As an alternative, our accommodation in Bukit Lawang arranged a car to pick us up at our guesthouse in Medan and take us directly to the hotel. The cost was 100,000 IDR (about €6.30) each, which of course is a little more expensive than the public bus, but less of a logistical headache since we carry huge backpacks. Related: Where did we head after Bukit Lawang? Consider a trip to Lake Toba! We also figured out by using the public bus from Medan to Bukit Lawang, we would anyway need a taxi to take us to the bus station which was located at a distance from our accommodation in Medan, so the costs of the journey by public bus might come close to what we were spending for the transfer. A direct transfer was also the means to avoiding all the potential touts and scammers and having to wake up early! The drive was about three hours long and we arrived in Bukit Lawang in the early afternoon. Bukit Lawang is situated on the eastern side of Gunung Leuser National Park which is home to the orangutans in Sumatra. 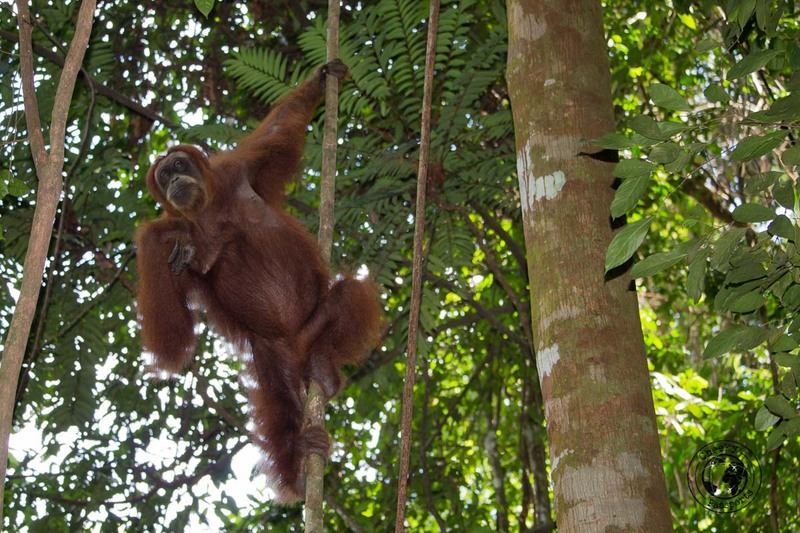 The orangutans in Bukit Lawang are considered to be “semi-wild”, meaning that some of them have previously lived in captivity. A rehabilitation centre for the orangutans was set up in Bukit Lawang to help them reintegrate into their natural habitat, and because some of them have previously lived in close proximity to or with humans, they are not fearful of us and are therefore easy to spot when you’re on a Bukit Lawang jungle trek. 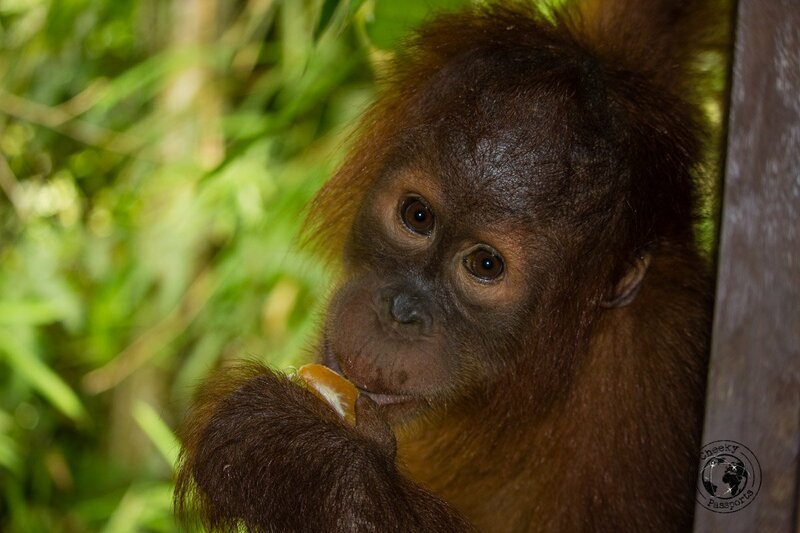 The rangers at the centre continue to monitor the orangutans’ progress in the wild and even provide feeding sessions until the creatures are fully self-reliant. Our accommodation of choice was Ida Guesthouse which, like many of the guesthouses and restaurants in the area, is located by the river bank in the jungle. At just 150,000 IDR (about €9.50) per night including a private bathroom, we felt that the basic but clean and comfortable room suited our needs perfectly. Several other guesthouses and basic hotels are located around the area and less basic jungle hotels such as Jungle Inn are also available. You can also check the latest accommodation deals in Bukit Lawang on Hostelworld, Booking.com or Agoda. 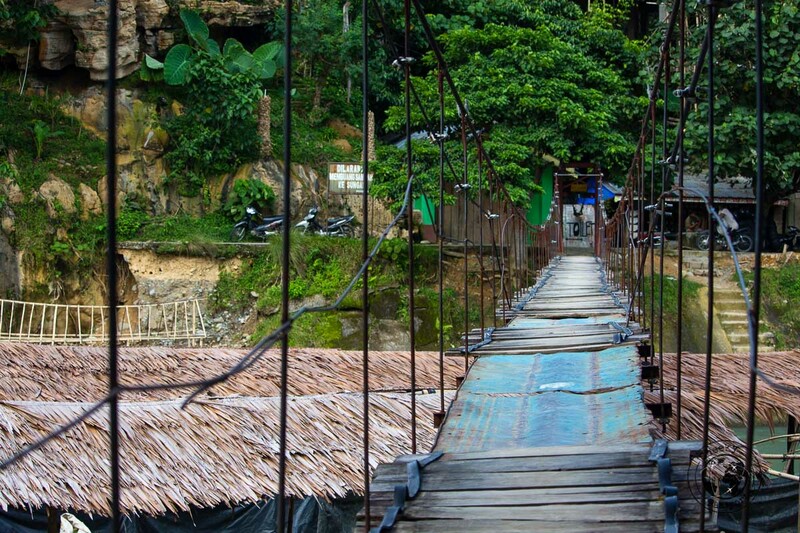 Many of the guest houses organise Bukit Lawang trekking packages. We always promote indipendent travel, but if you need a little help, why not get sorted earlier and book a Bukit Lawang tour through Viator? The Bukit Lawang jungle trek cost 650,000 IDR (about €40) per person. You can try to negotiate a little, but this is pretty much the going rate for day treks to spot the orangutans in the jungle. 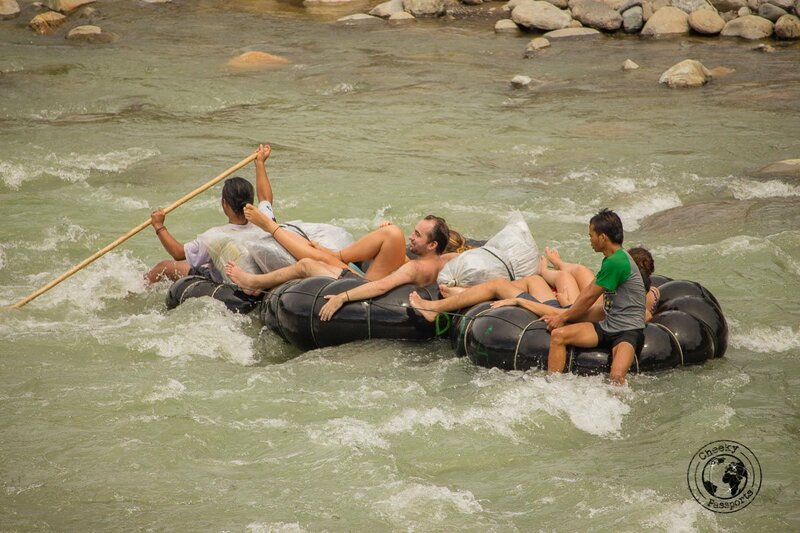 Multi-day Bukit Lawang trekking options, including camping in the jungle are also available. 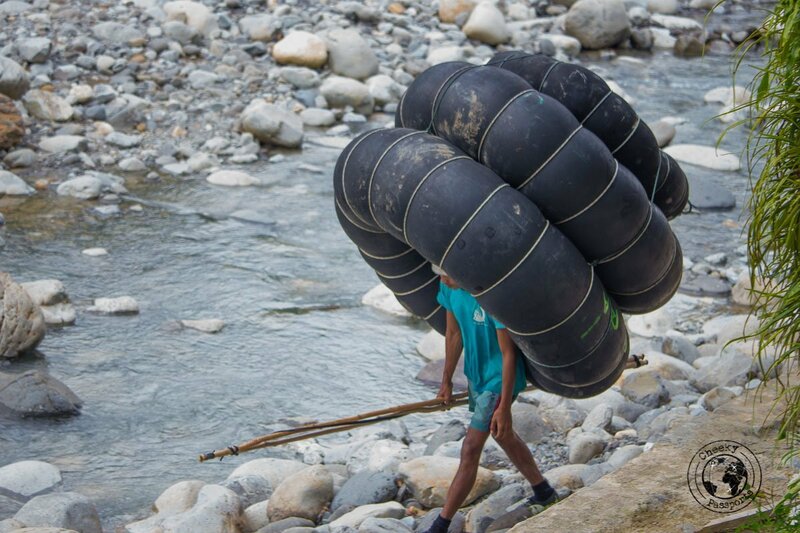 You can go river tubing or rafting after your trek too (at an additional cost) but we were not very keen on doing this ourselves, preferring to stay dry instead. Staying dry in the jungle was in no way possible though! We met Baba our guide at the guesthouse who showed us the way up into the jungle. A Bukit Lawang jungle trek is not difficult at all although the first part involves some climbing. After the first few minutes, sweat was already pouring down our faces and onto our t-shirts which were anyway completely soaked. I already longed for a shower at the point in time, but I would have to endure the wet clothes (which eventually became caked in mud too) for a lot longer. The beginning of the jungle trek was a little disappointing since we couldn’t locate any orangutans for a while. After about an hour we finally saw the first one high up on the tree tops, and soon after, a large female orangutan which seemed to be continuously in search of a smaller one (we assumed that this was her child) which kept jumping around. By the end of our Bukit Lawang trekking experience, we had spotted eight of the beautiful creatures including a very large male. Baba kept us at a safe distance from the large male orangutan who was on the ground. Apparently, it is easy for orangutans to attack when they are grounded (and feel threatened), and this guy was so large that he could have taken out a group of people very easily. Towards the end of the trek, we arrived to a wooden structure where, to our delight, two young orangutans seemed to be enjoying some playtime. They weren’t too deterred by our presence and actually eyed our fruit supplies greedily. 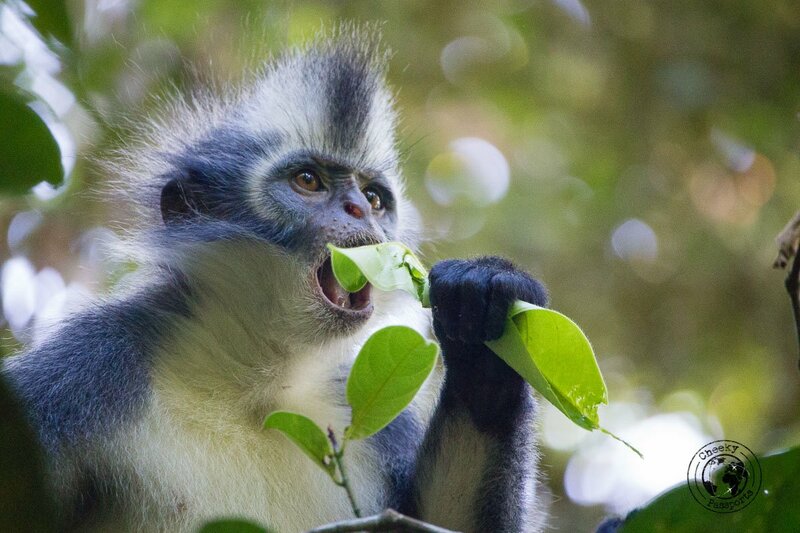 On the way back to the village we saw lots of Thomas Leaf monkeys which observed us with the same curiosity we showed towards them. We could actually get rather close to them – they didn’t seem to mind us in the least! Orangutans can also be observed on the island of Borneo. Follow this link to read all about it. Related: Are you weary of monkeys? Read about our misadventures in Tioman’s Monkey Beach! The Bukit Lawang jungle trek included a break for snacks (passionfruit and bananas) and a lunch stop. 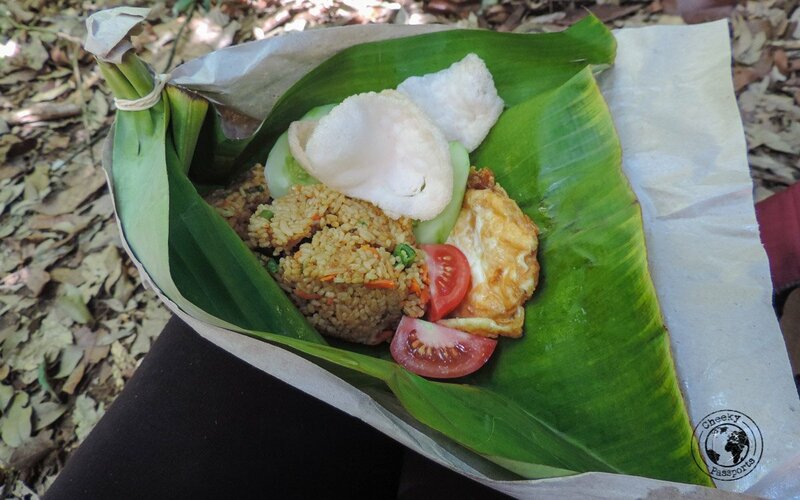 Lunch was a very welcome omelette, nasi goreng (fried rice), veggies and lots of fruit. It was more than sufficient and very good! Baba was an excellent guide who constantly explained what was going on in the jungle, answered all our questions and provided information about Bukit Lawang. If you have the opportunity to trek with him, be sure to go for it! Use lots of (appropriate) insect repellent during your Bukit Lawang jungle trek. The insects will cling on to your sweaty skin and they will bite! Baba instructed us to use the repellent just before we entered the park area. Wear shorts or leggings but no long pants. 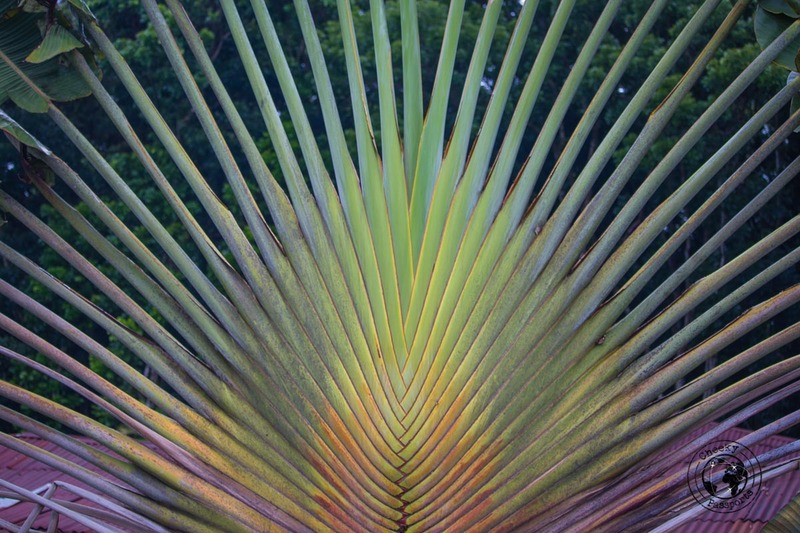 It is immensely hot and humid in the jungle and you might just boil away in long pants! Also, you will get so muddy that washing long pants after the trek will be no easy task! Listen to your guide. Most guides have been brought up in or around the jungle and are far more aware of the jungle environment and Bukit Lawang trekking than you will ever be. They are the experts here so be sure to follow their every instruction and move! Do not feed the orangutans. 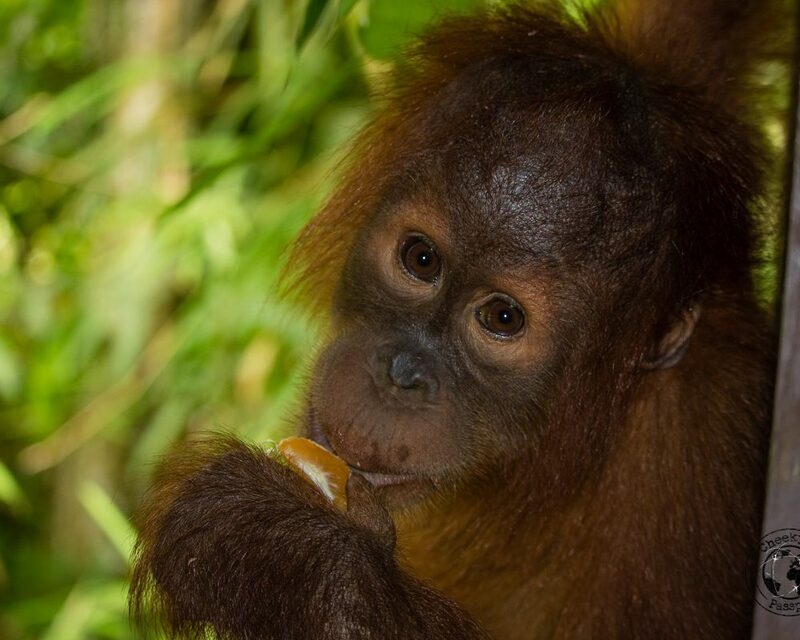 Such an activity encourages the orangutans to rely on humans feeding them, rather than on sourcing their own food. Be mindful about using flash photography during your Bukit Lawang trekking experience. Baba guided us as to when it was ok to do so and when it was not. Our favourite place to eat in all of Bukit Lawang was Cafeteria Gua Lawang, a small place at the entrance of what looks like a cave, with low, elevated tables and cushions. 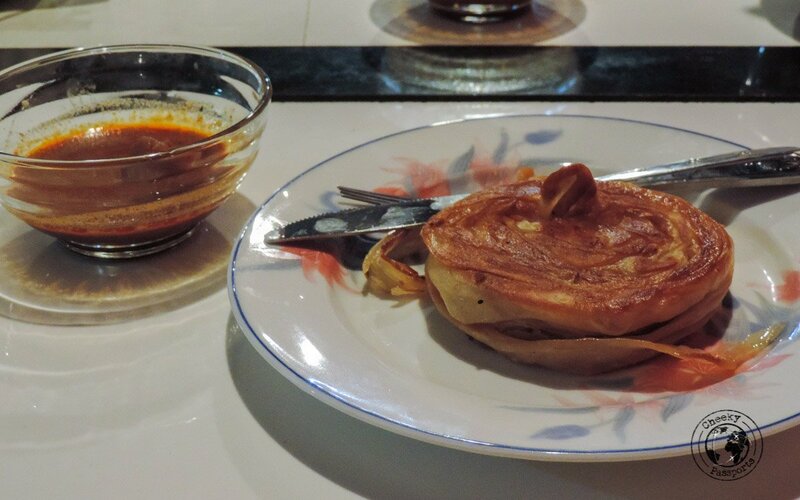 The café offers a variety of roti, murtabak, pasta, fried chicken, burgers and juices at very affordable prices in a very relaxed environment – we kept going back just to taste different items on the menu! Our Bukit Lawang trekking experience in Sumatra was a great introduction to Indonesia, where we are currently spending four months traveling around different islands, since there so many awesome things you can only do in Indonesia. We are delighted to have kicked off our adventures in the country with a Bukit Lawang jungle trek! Oh dealing with the rain in the jungle sounds hard indeed! We agree that seeing the orangutans was great despite the many insect bites! !